Today, when we want to learn about essentially anything we turn to our screens. While we have access to limitless information, the filtering process and the quality of the information is largely determined by popularity. Usually at the top of our search results are videos, the more the video is watched the more it comes up in search results. 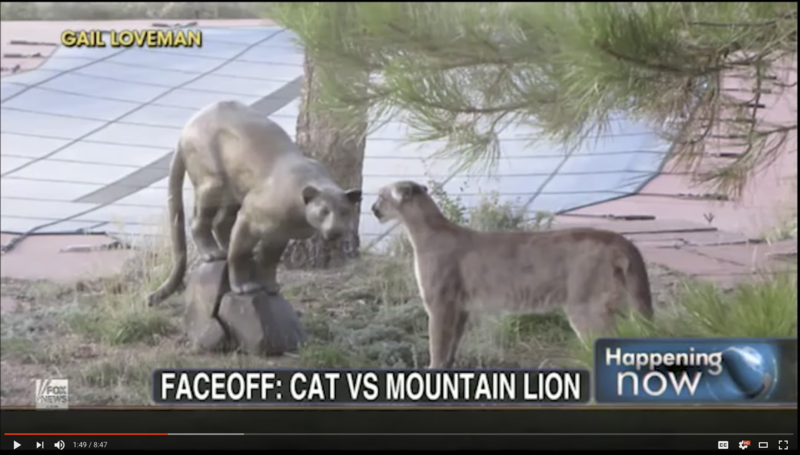 What sort of video information could be collected on Mountain Lions, with a focus on Arizona, through the search engine process? What was found created more questions than answers. The media format sending the information is new and progressive, the messages being delivered are not. Many of the videos represent the same conundrum of misinformation and exploitation that have historically always been applied to the mountain lion. Documentaries and science research, while present and available, have stiff competition for viewers among other more enterprising videos. Description: How do we learn about animals in the digital age? How do we learn about nature through our screens that primarily aim to capitalize on our attention? How do science and facts compete in the media landscape? How can we intelligently participate in making decisions about animals and ecosystems, if when all we see when we look at it is the stories? This entry was tagged All Images, Wildlife. Bookmark the permalink. Alison is from one of the many small remote towns in Idaho, hers being Idaho City, Idaho. Living in an old mining ghost town, she developed a strong interest in American Western history, it's sometimes strange people and its curious stories. In her visual work she tries to be aware of the mythology of the west and embrace its contradictions while still retaining some romanticism for the landscape that is her home. Alison creates mixed media prints, videos and installations. Today, when we want to learn about essentially anything we turn to our screens. While we have access to limitless information, the filtering process and the quality of the information is largely determined by popularity. Usually at the top of our search results are videos, the more a video is watched the more it comes up in the search results. What sort of video information could be collected on Mountain Lions, with a focus on Arizona, through the search engine process? What was found created more questions than answers. The media format of the information is new and progressive, the messages being delivered are not. Many of the videos represent the same conundrum of misinformation and exploitation that have historically always been applied to the mountain lion. Documentaries and science research, while present and available, have stiff competitions for viewers among other more enterprising videos. How do we learn about animals in the digital age? How do we learn about nature through our screens that primarily aim to capitalize on our attention? How do science and facts compete in the media landscape? How can we intelligently participate in making decisions about animals and ecosystems, if when all we see when we look at it is the stories?